2008 will go down my memory as the worst year in my existence :-) [I hope I don't change that statement!] - I wanted to start this year auspiciously, by celebrating Maha Shivaratri. Over years, my fasts have become stricter. I woke up early on Monday, and decided I'll take up the strictest form of the fast. In this version of the fast, one cannot eat or drink anything (including water) till the next day morn, after staying up the whole night. The chanting consists of two parts - Namakam and Chamakam. The word 'nama' is occurs repetitively in namakam - The word 'nama' means 'to bow down in respect. 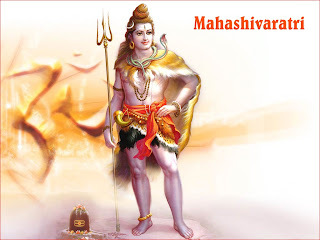 In this part we mentally bow down to different aspects of Lord Shiva. There is a lot more, but I'll restrict to these. Shiva takes a terrifying posture of 11 Rudras when the Universe is destroyed - The first few verses seem to indicate those forms. After namakam, usually chamakam is chanted. Chamakam seeks blessings from Lord Shiva. The word 'cha me' is used repetitively in Chamakam and hence it gets its name. Chamakam is the best way to seek blessings (we may ask for something lame!) - chamakam makes us to request Lord Shiva different things - Long life, health, wealth, concentration, sufficient food etc. Chamakam consists of 11 parts. In ekadasi rudram, full namakam is chanted once, and first part (anuvakam) of chamakam is chanted. Then full namakam is chanted again, and then the second anuvakam is chanted and so on. It can take from 3-4.5 hours based on your speed. I did one round ekadasi Rudram from 1:00 pm to 4:30 pm. And, then I went to my brother-in-law's (Deepak Rajaram, my sister's husband) home. He is an intense Shiva Bhakta, and is extremely well read in scriptures and rituals. Though he is only 30, he has been doing ritualistic pooja for about 20 years now!!! I joined him and couple of his friends at his home - So, I had to do Ekadasi Rudram again that night. The prayers were elaborate with tons of flowers, cut fruits, honey, ghee, dhoopam, deepam, curd etc offered to the Lord - The Shiva Lingam that Deepak had, should definitely be satisfied with the level of Abhishekam done that night! Then, at the conclusion of prayer, I had planned to ask certain things from the Lord (which I never do!) - Thankfully, at the end of the prayer, by Lord's Grace, I forgot to ask what I wanted to ask :-) - I wouldn't have forgiven myself if I had gone ahead and asked what I wanted! To summarize, I had a great Maha Shivaratri celebration and am looking forward to an awesome 2009! Anti Hindu TN Government, has decided to take over Chidambaram temple :-( - There are very few temples in TN that are away from the bad influence of TN Governement. Now, TN Government is planning to take away the temple by force. Some friends are working on spreading the knowledge and taking the protest across the world. And, most importantly, spread the word! PLEASE! iPhone 4 and the Bars! Apple's solution - Will it Help?